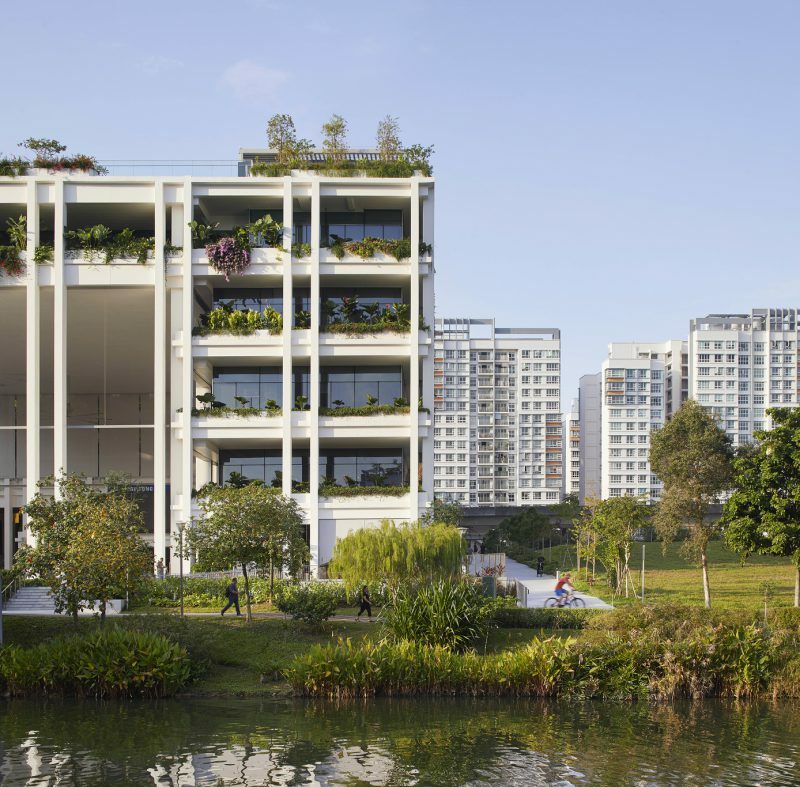 Oasis Terraces is a recently completed community centre and health clinic in Singapore, which incorporates a communal terraced garden overlooking a canal. With the rising importance of green space, especially in polluted, concrete urban areas, numerous architectural firms now incorporate greenery into their building designs. The use of roofs for farming or rooftop parks has been a growing trend for a while now. A recent project by London-based Serie Architects and Singaporean Multiply Architects also joined this movement. 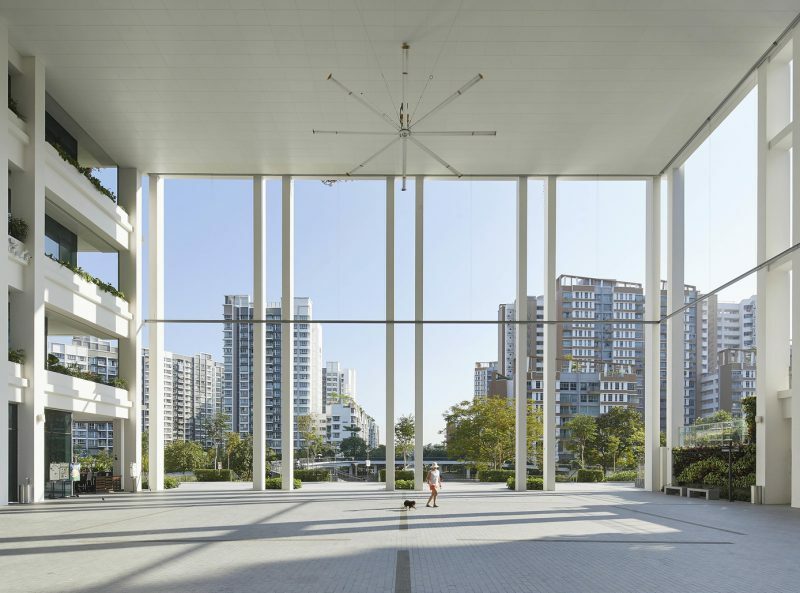 Together, the two architectural companies have designed, and recently finalized a community center for Singapore’s Housing and Development Board. The Oasis Terraces building is located on the banks of the waterway in the very densely populated Punggol area. It serves as a retail and community centre with restaurant, shops and other communal facilities, as well as a polyclinic. Surrounded by tall housing blocks, its open facades and green elements are a contrast in the neighborhood and create an open, inviting atmosphere. 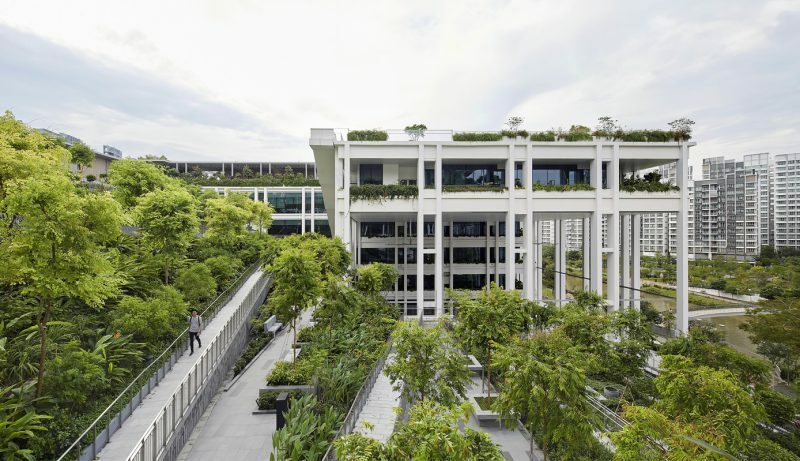 The interior of the centre is built around, and connects to the garden terraces so that clients of restaurants or the clinic’s users can look out onto the greenery and water. The whole space is four-storey tall and column-free to bring in a sense of lightness and openness. It allows daylight and a soft breeze to permeate the building, promoting natural light and ventilation. The center’s roof incorporates planting beds which can be used for urban farming, adding a social value to the design. Furthermore, there is a pedestrian walk connecting the roof gardens of Oasis Terraces with the adjacent waterway. The whole project, apart from bringing in an aesthetic value to the neighborhood, aims to bring people together to engage in planting and maintaining the gardens, and making use of the communal spaces in the center. 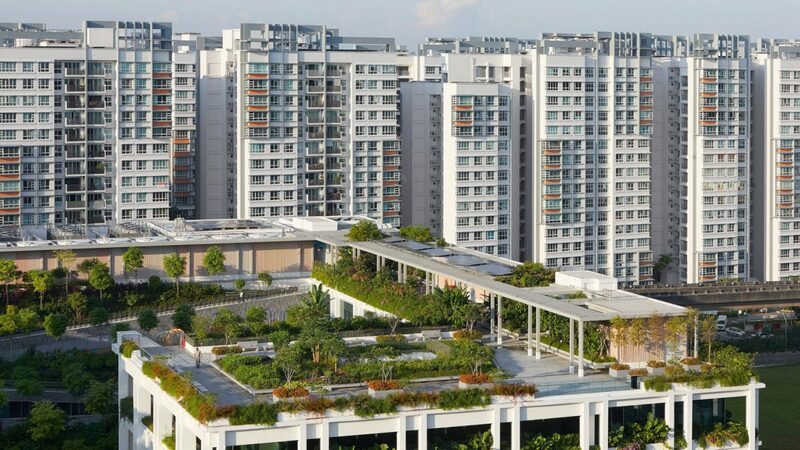 The practicality of the building is enhanced by its important contribution to the community life and environment of Punggol making it a multi-purpose sustainable project. This City Socks… And Shoes! Here’s another solution for putting those tools gathering dust in your house to use: make them available for lending at your local Tool Library! Opening next month, Toronto’s Tool Library is one of many similar projects that have popped up all over North America, Australia and Europe. The recent popularity of tool libraries is another example of how the peer-to-peer economy continues to gain popularity and evolve, changing the way we interact with each other and our cities.